You'll be £14.99 closer to your next £10.00 credit when you purchase Combat Aircraft of the United States Air Force. What's this? From its humble beginning in August 1907, when the U.S. Army Signal Corps created its Aeronautical Division assigned: “to take charge of all matters pertaining to military ballooning, air machines, and all kindred matters.” That small in consequence portion of the U.S. Army would grow progressively over the many decades to become its own separate entity following the Second World War, named the U.S. Air Force in 1947. It became overnight the world’s most powerful military establishment, able to deliver conventional and nuclear ordnance anywhere around the globe. Today’s cutting-edge example of that is best represented by the supersonic, bat-winged B-2 Spirit stealth bomber, which can fly at an altitude of 50,000 feet, and is built of carbon-graphite composite materials. The B-2 Spirit is a far cry from the early days of the service when it relied on fragile prop-driven, wood and fabric-covered aerial platforms, such as the Wright Type B, which could barely reach an altitude of 100 feet. As this superb illustrated and well informed book vividly demonstrates, in between have been such iconic aircraft as the P-51 Mustang and P-47 Thunderbolt fighters and bombers such as the B-25 Mitchell, B-17 Flying Fortress and B-29 Super Fortress which dropped the first A-Bomb in 1945. The Cold War demanded ever more powerful aircraft, such as the B-58 Hustler and B-52 Stratofortress and fighters including the F-86 Sabre, F-104 Starfighter and F-4 Phantom. In precis, this work is something of a mixed bag; it has beautiful photographs (especially colour ones) and a well-researched and well-written text. As such it would be useful as an introduction to its subject. Something just a little bit different from usual for this new addition to the Images of War series, for the bulk of the pictures in this one are in colour, though there are still some black and white archive pictures. As usual, this is a photo book, but with some informative and well balanced background text to introduce each chapter, along with helpful captions on all of the photos as well. 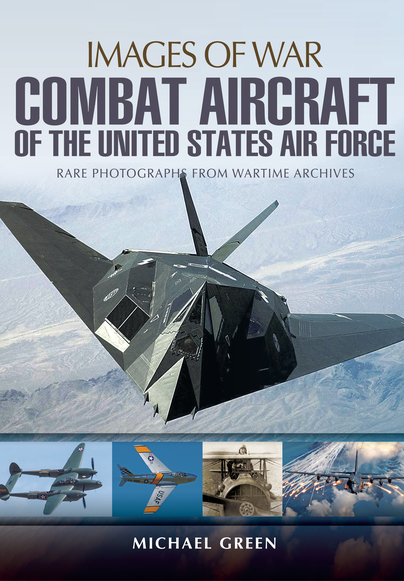 A good collection of photos which make a good job of illustrating the many combat aircraft used by the USA over 100 years plus of history, from those flimsy, early biplanes, through to the supersonic and stealth aircraft of the 21st Century.